Anti-Fatigue, Insulating, Interlocking Floor Tiles. Motomat is a moulded, non-slip tile with a cellular structure that gives excellent durability and comfort. With it’s unique puzzle join they are very quick and simple to install. No special skills or tools needed and there’s no costly base works required either. 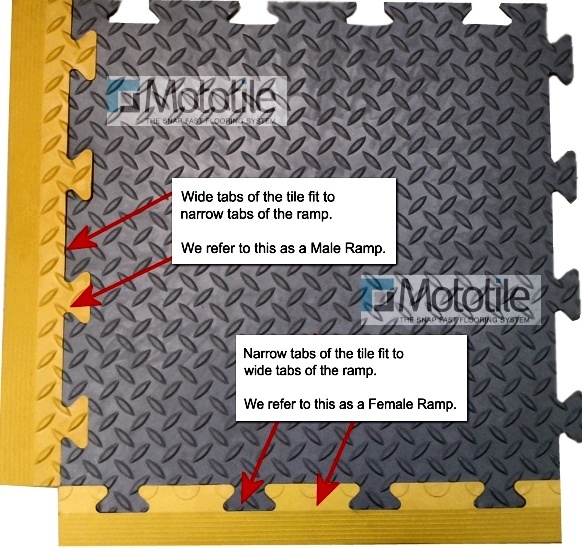 Motomat is perfect for protecting floors whether in a large factory or just the floor in your garage. They are designed to absorb shock and noise, are suitable for all weathers and extreme temperatures. And to cap it all, Motomat is fully wheelchair, pushchair and trolley compatible. Motomat vinyl tiles are high quality, durable and fire resistant and should not be confused with the cheaper foam alternatives. 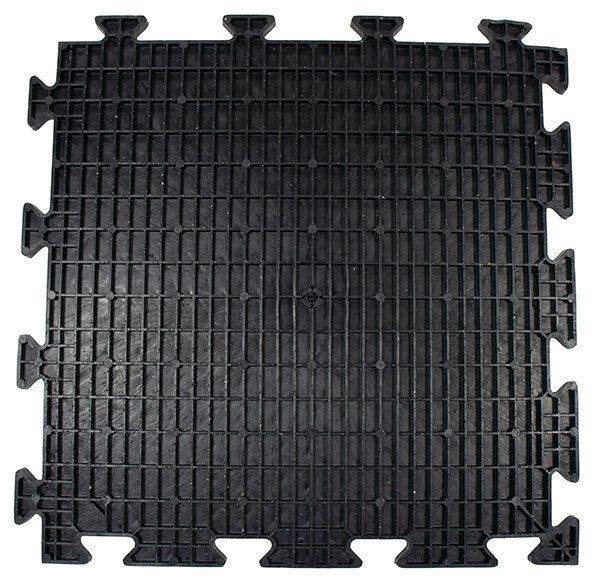 Black recycled PVC tiles £3.75 each (ex vat) : £15 sq m (ex vat). 'Jigsaw' interlocking fit PVC tiles. This tile is nominally 500 x 500 mm but for estimation purposes we treat it as 470 x 470 mm. For an explanation - see the tile dimensions guide. - Floor areas subject to standing water. 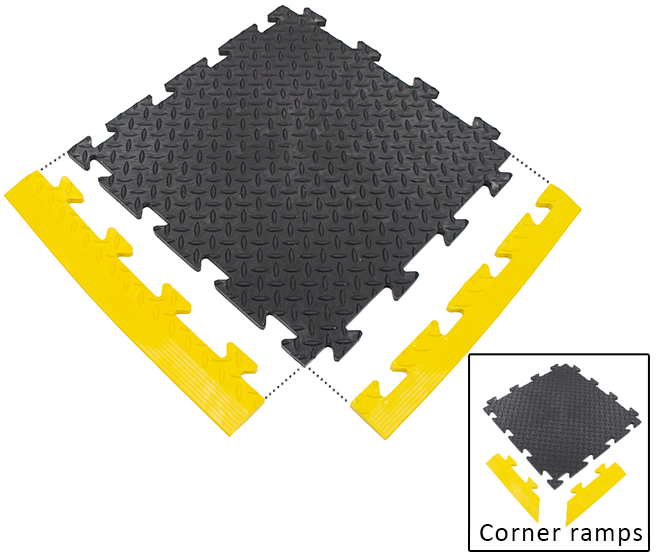 Available as Cointop (studded) or Diamondplate (chequer) face patterns manufactured in recycled PVC. 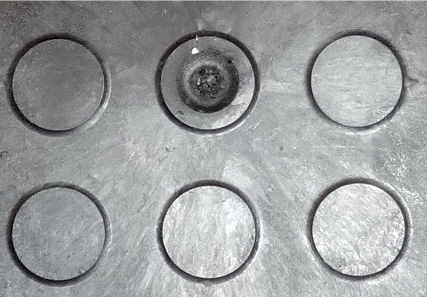 Image above shows the underside of the tile to illustrate the colour flecks apparent in recycled PVC material and the cellular structure of the reverse side of the tile. Colour flecking is more evident on the underside of the recycled tile. Please Note: MotoMat tiles have a central 'navel' dimple. This is not a manufacturing fault but is an artefact of the injection moulding process used to produce them. - Resistant to most solvents and chemicals. - Reduces damage caused by impact, abrasion and vibration. - Quick and simple to install or remove. - Good thermal and acoustic insulation. - Protects your existing floor from damage. - Eliminates dust generated by old concrete floors. - Smart modern checker plate design with a unique puzzle join that can be laid parallel or bricked. - The floor can be used as soon as the tiles are laid. - Non-Slip - good for wheelchair user etc. - Low maintenance and easy to clean.